Radioactive isotopes from Fukushima Daiichi were detected in Ireland only days after the March 11th disaster. By April, radioactive isotopes were detected on the offline systems at Cahirciveen, Kerry; Clonskeagh and Glasnevin in Dublin; and Cork, Knock and Shannon Airports. Dr Ciara McMahon, the Radiological Protection Institute of Ireland’s director of environmental surveillance and assessment said the Fukushima incident delivered a total estimated radiation dose to an adult in Ireland of 0.26 microsieverts. The elevated levels of radiation in Ireland were detected in Ireland during the period March to May 2011. The activities of these radionuclides peaked in the period March 27th to April 11th. During the leak period, other short-lived radionuclides were detected with significantly lower activities. These were caesium-136, a further short-lived caesium isotope; telerium-132, another volatile fission product which decays to iodine-132; and iodine-132 itself. The levels detected were consistent with those measured elsewhere in Europe. The highest recorded iodine-131 activity on airborne particulates was 1,000 μBq/m3 at the end of March. Caesium-134 and caesium-137 levels in air peaked during the first week of April at 128 μBq/m3 and 138 μBq/m3 respectively. 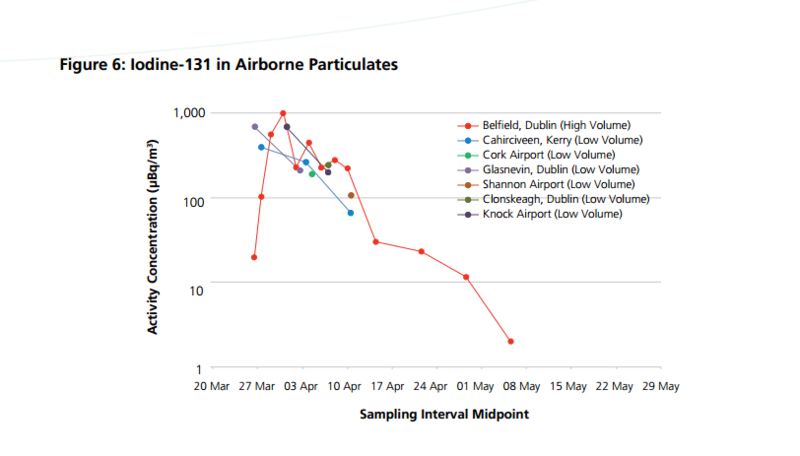 Iodine-131, caesium-134 and caesium-137 were also detected on filters from low volume air samplers at various locations across Ireland. Gaseous iodine-131 was also detected in activated charcoal filters from the same low volume air samplers, mainly during the last week of March and the first two weeks of April 2011. Iodine-131 was detected in some rainwater samples during the same period. Dr McMahon said the institute maintained 14 permanent radioactivity monitoring stations across the country. The monitoring stations detected radioactive Iodine-131 and two forms of radioactive Caesium, Cs-137 and Cs-134. The frequency of sampling and analysis of air, rainwater and milk was stepped down to the usual frequency for the routine monitoring programme at the end of May 2011. Within seven days of the first detection of radioactivity resulting from Fukushima in airborne particulates, trace levels of iodine-131 in milk were detected. The highest level measured was 327 mBq/l. Elevated levels of caesium-134 and caesium-137 were also found in some samples. Assuming, as for airborne contamination above, that the levels of radionuclides in milk persisted for the two-month period from mid-March to mid-May, the total doses from the ingestion of radioactivity in milk as a result of the Fukushima accident were 0.13 μSv (130 nSv) and 0.32 μSv (320 nSv) to Irish adults and children respectively.